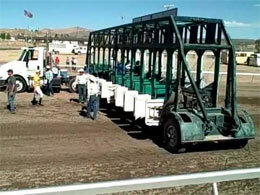 Jrs Blue Boy won the $33,410 Intermountain Futurity Monday at Elko County Fairgrounds. ELKO, NV�SEPTEMBER 7, 2015�Ridden by jockey Jesus Canales, Jrs Blue Boy broke in and bumped at the start before racing to a neck win over Scooter Willie in the $33,410 Intermountain Futurity Monday at Elko County Fairgrounds. Gimme A Hottie finished 1� lengths back in third. Saddled by Riley Moosman the Sam Allie owned Colorado home-bred completed the 350 yards in :17.966 seconds to earn a 96 speed index. It was the third win in three starts for the undefeated son of first crop sire FANTASTIC CORONA JR, out of Lil Blue Blitz, by Dash To Fame. The $13,364 winner's purse boosted his career total to $16,964. Scooter Willis picked up $6,683 for his second place effort. Ridden by Uriel Dominguez, the gelding races for owner Lawrence Blonquist. Chad Giles trains the Utah-bred earner of $8,332. Jon Blonquist bred Scooter. Brent and Sherry Young's Gimme A Hottie earned $3,341 for finishing third. Brent trains the filly with Rachel Goodgame was riding. Mark Of A Nobleman, Coopen Hagen Cowgirl, Chew Chew Chick, Good Times, Dash N The Wind and Five O completed the field. Z E E Jess was scratched.